Discover what Americans and Israelis really thought about their counterparts during Israel’s “Impossible Era.” Survival, peace and dreams were at stake—an Israeli yearning for commitment versus American demands for respect. Shouting to negotiate. A zest for life versus “a cold, robotic approach.” “Why can’t you bend your mentality?” “Israelis are awful, but Americans are vicious.” “We need it, so why can’t you just give it to us?” A U.S. diplomat descends into a fistfight in Tel Aviv (and enjoys it). An American negotiator nearly has a heart attack during a tense session with Ariel Sharon. Why was Menachem Begin so admired by American diplomats? Yitzhak Rabin warns that Americans have no sense of humor. Shimon Peres reflects on achieving top marks in New York’s New School courses when he was first learning English. Blending biographies, photographs and autobiography, this work will bring back a rush of memories for many. Author Dr. Joyce Starr directed the Near East Studies Program of the Center for Strategic & International Studies (CSIS) for more than a decade. A life-long Independent, she served in both Democratic and Republican Administrations. She has also advised Israeli universities and international think tanks. 5.0 out of 5 stars WOW! What a fascinating and incredibly timely read!! Dr. Joyce Starr’s “Israel’s Impossible Era: The Human Element in U.S.-Israel Relations” opens windows and doors into the minds and hearts of the leaders of two of the greatest and most improbable nations in the history of the world. From cover to cover you will find wonderful recitations of the author’s face-to-face meetings with Israeli prime ministers and top U.S. officials. Dr. Starr offers many personal and candid moments which reveal intimate insights into the inner workings of the minds and emotions of some of the greatest leaders of our time. What a fascinating and incredibly timely read!! If you care about Israel, this book is a must-read and must-have. I purchased additional copies for close friends and my synagogue library. Dr. Starr is a story-teller. Granted rare access to Israeli leaders and to U.S. officials, she writes from a refreshing and unique perspective about the human element in high level negotiations. I love the historic photographs and the memories they evoke. This book is a treasure. 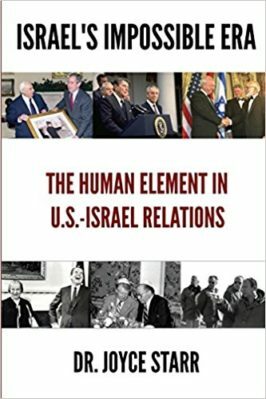 Dr. Starr’s book, Israel’s Impossible Era: The Human Element in U.S.-Israel Relations” clearly demonstrates the author’s genuine love and respect for “The Giants of Israel” (e.g. Ariel Sharon, Shimon Perez, Menachim and Aliza Begin). The author’s colorful vignettes combined with her cherished personal stories illustrates a deep understanding for the political complexities which these extraordinary individuals courageously addressed during their term in office. Dr. Starr clearly recognizes what an extraordinary privilege it was to have known these historical figures in such a personal way. Anyone who loves and appreciates the legacy of the State of Israel will enjoy both the personal and historical accounts presented in this book. Dr. Starr tackles the cultural divide between U.S. and Israeli leaders with insight, empathy and humor. This book should be required reading for State Department and White House officials. Insider stories about Israeli legends and a remarkable collection of photographs echo hopeful times. An inviting, highly readable and uplifting work.